Westside Family Healthcare staff give dental care to a patient. The lack of affordable dental coverage results in real costs to people’s health and finances -- and to the state. A few years ago, Bear resident Jessica Favacchia was struggling to find a dentist for her mother, Janice, who has Alzheimer’s disease and lives in a nursing home. Janice has Medicaid, which doesn’t cover dental care. Jessica said the few clinics in Delaware that offer low-income dental services had long waits. And then her mom fell and cracked her teeth. The federal government leaves it up to states to decide whether they will cover dental services for those on Medicaid. Delaware opts not to offer dental coverage. AmeriHealth has a Medicaid plan that offers dental. But that benefit only helps 957 Delawareans. Poor oral health can take a toll financially and on a person’s health. Data from the Center for Health Care Strategies shows Delaware and just two other states, Tennessee and Alabama, don’t provide dental coverage for low-income adults. Delaware’s decision impacts about 146,790 adults on Medicaid. There’s a small number of places in the First State that offer reduced prices for dental services. La Red Health Center, Henrietta Johnson Medical Center and Westside Family Healthcare have a sliding scale. Delaware Tech has a fee schedule for procedures. And Nemours offers dental services for low-income seniors. Christiana Care Health System has a dental clinic and an oral and maxillofacial surgery program that can see patients who present with emergency issues. Jessica's mother Janice went to Christiana Care’s emergency clinic for her cracked teeth, and got established as a regular patient. But aides at the nursing home struggle to get her to let them brush her teeth. And Jessica said she continues to experience problems. 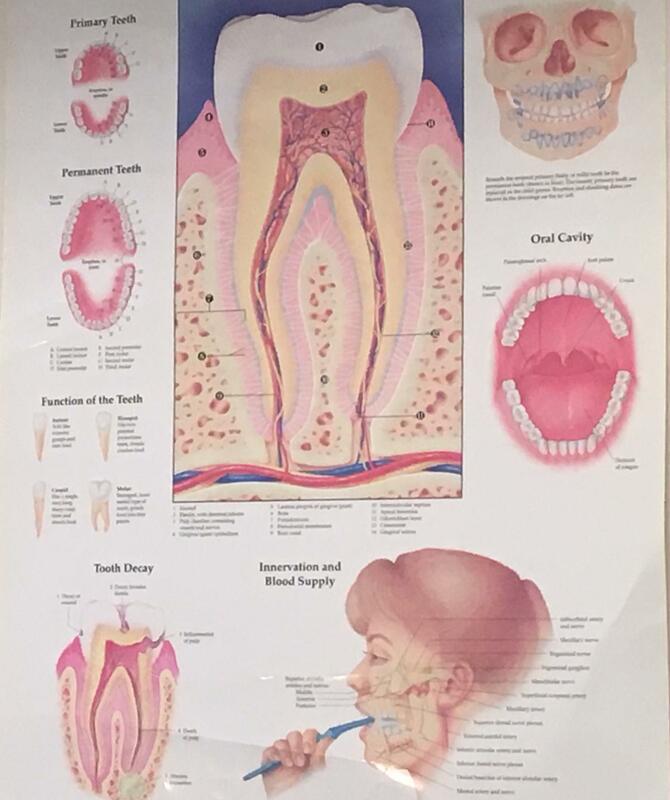 A picture of Janice's, Jessica's mother, teeth. Dan Meara chairs Christiana Care’s Department of Oral and Maxillofacial & Hospital Dentistry. 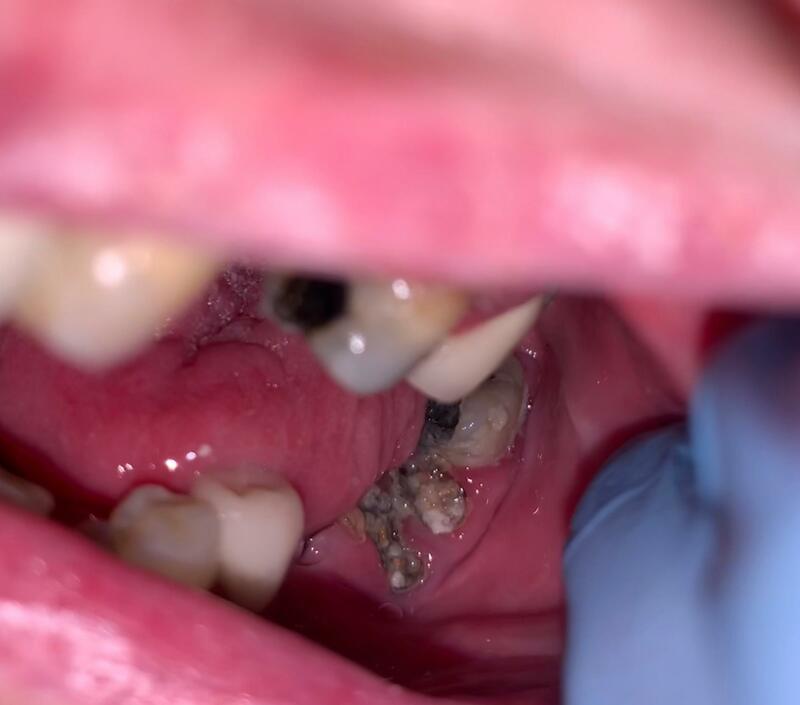 He said untreated dental problems can cause infections and abscesses in the face, the neck and jaw areas. Some patients can spend days in intensive care or even die. Meara said tens of thousands of surgeries nationwide every year could be prevented by something as simple as getting a cavity filled. But when you don’t have the means to get preventive care, nothing about it is simple. Nayeli Abrego has been a patient at Westside for more than 10 years. The 36-year-old New Castle resident is paying $50 on this day to get a cavity filled. Abrego said she’s had it since last October, but she lost her job and couldn’t afford the co-pay. Megan Werner is the Associate Medical Director for Westside. She argues preventive oral care lowers the risk of complications to vulnerable populations like pregnant women. “So when you don’t have good oral health care, you wind up getting a lot bacteria in your mouth that then contribute to inflammation in your gums and it’s thought that that chronic inflammation and that load of bacteria contributes to the preterm delivery and the low birth weight,” she said. Werner adds that people with chronic diseases like diabetes who neglect their mouth can make their health conditions worse. Oral surgeries at Christiana and treating more severe chronic conditions because of poor oral health can cost pretty much everybody; the federal government, the state, hospitals and families. Meara and Werner argue Delaware would save money if funded preventive coverage through Medicaid. About a dozen states, including Maryland only offer emergency dental services with about six states giving emergency care to their expanded Medicaid population. But Maryland is starting a pilot program next month to cover low-income adults on Medicaid after doing an analysis on how much it was costing it. That analysis - done with the American Dental Association - found there was more than 42,000 ER visits for chronic dental conditions between 2013 and 2016. The average cost of those visits was $446. The Delaware Department of Health and Social Services was unable to provide similar information for the state. Mary Backley is the executive director of the Maryland Dental Action Coalition. She said Medicaid was being billed nearly $10 million for those Maryland ER visits, costing the state money, but she notes that underlying issues also were not being addressed. Christina Care found that for Fiscal Year 2012, it saw 3,900 ER visits, with an average cost of $480 dollars a visit. Those visits totaled nearly $2 million that year. About 53 percent of the patients had Medicaid and 25 percent had no insurance. In 2014, Delaware expanded Medicaid, adding about 68,000 adults to the rolls. Former State Sen. Bethany Hall-Long, now Lt. Gov, sponsored legislation in 2015 providing dental coverage for pregnant women. The fiscal note estimated the bill would help more than 2,500 women at a cost of $1.68 million over three years. Hall-Long also sponsored a bill in 2015 to give nearly 117,000 uninsured adults on Medicaid dental benefits. It was estimated to cost about $4.3 million in fiscal year 2015 and $7.39 million in FY 2016 and 2017. Neither bill had enough support to pass the General Assembly. Gov. John Carney, like previous Delaware governors is not recommending expanding Medicaid dental coverage for low-income adults this year. He said he’s unaware of the benefits of preventive dental services. “But it makes sense that obviously we do what we can to make sure that as many Delawareans all Delawareans have comprehensive health care services,” he said. The U.S. Surgeon General is working on a national oral health report, due out next year. A health policy expert with the American Dental Association said he believes it will partly focus on the economic cost of states not providing dental coverage. About 44 percent of low-income adults in Delaware say the condition of their teeth affects their ability to interview for a job. He said that percentage is one of the highest of any state. Jessica Favacchia said she remains worried her mother’s poor oral health could lead to other health complications. Nayeli Abrego and other Medicaid patients say they hope Delaware starts covering dental services for adults.